The week before last we headed to Cape Cod to enjoy a week's vacation. I've been meaning to write about all the fun and exciting things we did but we've been too busy having more fun. This summer is really shaping up to be an A+. We're having so much fun in the sun and the vacation was more of the same! I actually was hesitant to go on vacation and by hesitant I mean I didn't want to book the vacation at all. In previous years we have done vacations with my husband's family which is always a blast. It didn't work out this year though that we could all do a joint vacation so it would just be me, Tim, and the kids. Although I (obviously) love spending time with them I just envisioned it basically being a lot of work for me. I mean I was going to pack up all our stuff here to move it to another house for a week where I would still need to cook, clean, and do laundry? How fun would that be? But it turns out it was a lot of fun! We spent the week in Hyannis where we were we could walk to the beach. The beach had an ocean side and a bay side which was perfect so we could hunt for seashells and enjoy some waves and then the kids could enjoy some easy swimming on the calm side. 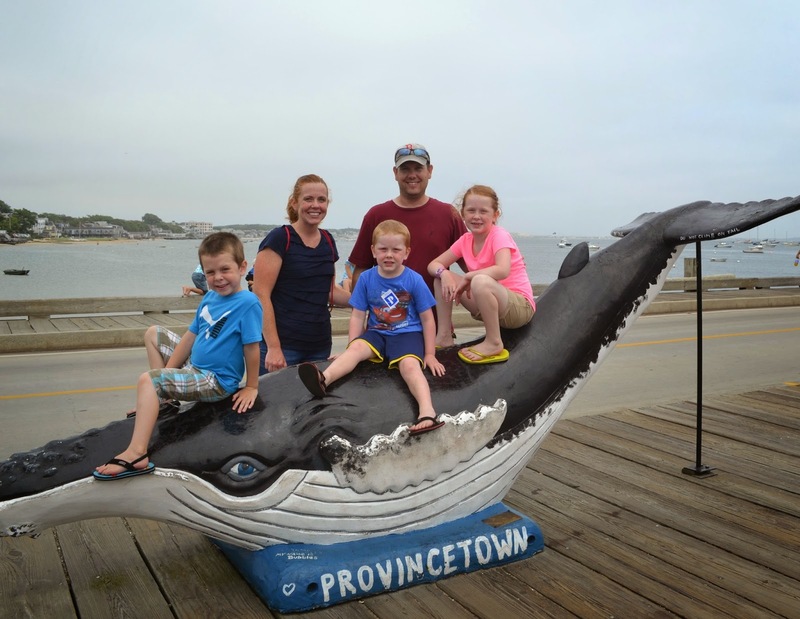 We also spent a day in Harwich visiting my aunt and uncle, a day in Provincetown, a rainy day with friends bowling and going to the Cape Cod chip factory, and my brother and his wife came down for a beach day, too. There were smiles, games, ice cream, and booze. Fun, fun, and more fun! I know I'll never get around to writing about it all so I figured I would share some of my favorite pictures from the week. So again, to recap the vacation, it was...FUN! We climbed to the top - twice! It's a whale - AHHHHH! So there you have it - a great vacation! I'm already thinking of what we can do next year!